With craft beer now a booming industry, independent breweries seem to be popping up around the country left, right and centre. Last week was a first for us when Hog Roast Cheadle was asked to provide the catering at a local brewery, situated within an industrial unit. They now operate a fortnightly taproom with different food vendors providing guest catering on each occasion. 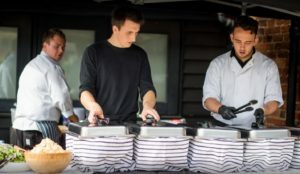 Last week marked their first anniversary of a successful year of trading so they wanted a more substantial catering offering for the larger number of guests they were expecting. We were, of course, happy to oblige! The brewery had also forewarned us that since they announced Hog Roast Cheadle would be attending the event on their social media platforms, there had been an influx in interest. We had to arrive fairly early on the Saturday morning as the slow roasted pig needed sufficient time to cook. In a marquee attached to the unit, we set ourselves up and by 2pm, were ready to serve today’s three delicious meat options: the aforementioned slow roasted pig, BBQ 100% beef 6oz handmade burgers and chicken kebabs; all served with soft-floured rolls and wraps, plus a selection of sauces laid out on a serving table next to our equipment. Our speciality vegetable tart was also on offer for vegetarians. Earlier in the afternoon, there were a number of families that arrived and the kids went mad for the burgers. As the afternoon progressed and more drinkers came out to play, the pig of course went down a treat, with many making repeat trips to our counter. Speaking to the Manager at the end of the evening, he advised us that they had never been so busy, especially as there was no real means of passing trade in such a location, set back from the high street. There was little food left over and the feedback we received was excellent. It was a different atmosphere to what Hog Roast Cheadle are accustomed to with a more urban feel but by the reaction we received, we would not hesitate to return.